New research shows climate change is altering the delicate seasonal clock that North American migratory songbirds rely on to successfully mate and raise healthy offspring, setting in motion a domino effect that could threaten the survival of many familiar backyard bird species. A growing shift in the onset of spring has left nine of 48 species of songbirds studied unable to reach their northern breeding grounds at the calendar marks critical for producing the next generation of fledglings, according to a paper published today in Nature Scientific Reports. That's because in many regions, warming temperatures are triggering plants to begin their growth earlier or later than normal, skewing biological cycles that have long been in sync. "The birds are trying to keep us with the speed of climate change but they can't…it's just too fast," said Morgan Tingley, assistant professor of ecology and evolutionary biology at the University of Connecticut, and a study author. "They can't adapt quickly enough." The multi-institutional study used data from satellites and citizen scientists to study how quickly the interval between spring plant growth and the arrival of 48 songbird species across North America changed from 2001 to 2012. Researchers found the gap lengthened by over half a day per year across all species on average, a rate of five days per decade—but for some species, the mismatch is growing at double or triple that rate. Nine species were clearly unable to keep up with the shift: great crested flycatchers, indigo buntings, scarlet tanagers, rose-breasted grosbeaks, eastern wood pewees, yellow-billed cuckoos, northern parulas, blue-winged warblers and Townsend's warblers. The study is the first to investigate the increasing mismatch between songbirds' springtime arrival and plant growth at the continental scale and across dozens of species, the researchers said. Previous studies have predicted climate change will drive hundreds of bird species to extinction and greatly reduce the ranges of others. But some are shifting the timing of their major life events, such as reproduction and laying eggs, in an attempt to keep up with the changes. The key question is whether this strategy will work long term, author said Stephen Mayor, a postdoctoral researcher with the Florida Museum of Natural History at the University of Florida. "If anything could adapt to climate change, you'd think that birds that migrate thousands of miles could," he said. "It's much easier for them to move in response to climate conditions than salamanders, for example, or trees." 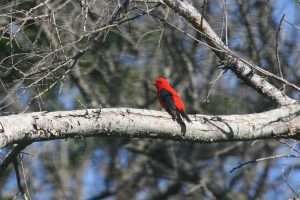 Birds leave their winter homes in Central and South America for the north based on the seasonal shift in hours of daylight, a cue unaltered by climate change. To produce healthy young, they must arrive at their breeding grounds to take advantage of the early-season boom in insects that emerge with springtime plant growth. But as climate change shifts the timing of when plants put out new leaves – a temperature-driven process known as green-up – migrating birds become more likely to reach breeding grounds when temperatures are still frigid and food is scarce or after insect numbers have begun to dwindle. The researchers found green-up is beginning earlier in eastern North America and – surprisingly – later in the West. 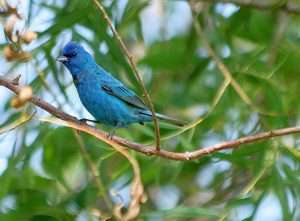 Birds that breed primarily in eastern temperate forests tended to lag behind while species that breed in western forests reached breeding grounds too early. The rate of change is concerning given predicted accelerating climatic changes, which could mean timing will be more out of sync in the future. "How quickly we can adapt and whether and how much of the natural world, including ourselves, lags behind where we should be in response to climate change is really one of the key challenges," said Tingley. The increased variability in weather conditions that comes with climate change could also compound birds' difficulties in tracking year-to-year changes. A resource that enabled the study's broad-scale investigation of nearly 50 bird species across North America are the tens of thousands of data points contributed by citizen scientists, the researchers said. 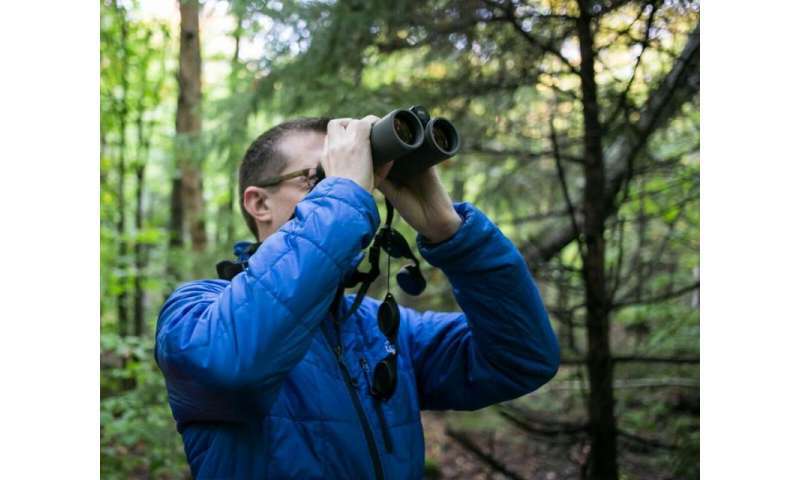 The so called "citizen scientists" are mainly amateur birdwatchers who enter their observations into the eBIRD database of the Cornell Lab or Ornithology. "As a single scientist no one ever collects data across the scale of a continent, a decade or multiple decades," said Tingley. "The study would not have been possible if it weren't for citizens – non-scientists – that are contributing their observations in their backyards and in their parks so we can actually study what has been happening over an entire continent over more than a decade." Diving deeper into the data to determine whether population numbers of bird species are falling is one of the next steps in the project. "The natural world is very complex," Mayor said. "When you kick it with a big change by altering the climate, different parts of that natural world respond in different ways. We're just beginning to understand the consequences of this grand unnatural experiment." Can barnacle geese predict the climate?